It is not secret that Disneyland is my happy place and that I am always noticing something new or making new memories. But it is seeing the park through the eyes of children that I think is amazing. Through the years I have been asked what is the best age to first take a child to Disneyland and my answer is always the same……three. I began taking my children when they each reached the age of three and it was amazing. Watching their eyes grow wide with excitement when they saw their favorite characters or hearing their giggles when a ride tickles their tummies is priceless. Many will say that three is too young because they will not remember the trip. I say so what!!!!! My son may not remember much about his first trip, but my daughter does. To be honest I don’t care if either of them remembers anything about their first trips, what matters is that I do!! I love that I have been able to watch my children grow up at Disneyland. I have witnessed their attitude and excitement over different rides change through the years. As they aged they became more choosy about who they will stand in line to see. Of course their excitement when seeing a favorite still remains. One particular character sighting always brings a smile to my face. When my son was 16 he chased down Pocahontas or as he called her PocaHOTness!! 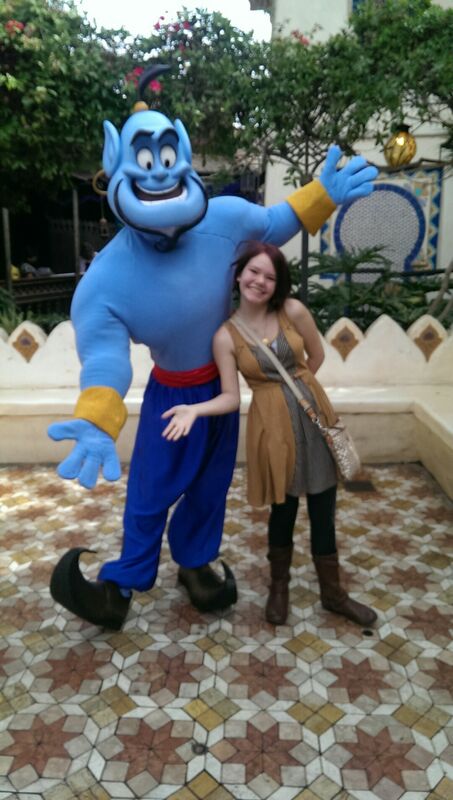 My soon to be a teen daughter still becomes giddy with excitement when she sees her favorite characters. As you can see in the picture above she loves to dance and have fun with the characters. I was given a glimpse of what sharing Disneyland with my future grandchildren will be like this past week and I can’t wait!!!! My best friend was in town with her family which included her absolutely adorable three year old grandson. Seeing his joy and excitement brought back so many memories of when my children were his age. Not to rush my son and daughter in-law, but after this week I can not wait to become a grandma!!! May your days be filled with Pixie dust and gentle hugs! ← There is no such thing as a simple cold.